Starring: David Jason, Nicholas Lyndhurst, Buster Merryfield, Paul Barber, John Challis, Sue Holderness, Roger Lloyd-Pack, Kenneth MacDonald, Gwyneth Strong, Tessa Peake-Jones. The Jolly Boys’ Outing is the 1989 Christmas Special of the popular BBC series Only Fools and Horses and sees the Trotter brothers go on their annual coach trip to Margate with the Nag’s Head regulars. However, the trip doesn’t go to plan and forces the gang to stay overnight where Del bumps into his old flame Raquel. Renowned British comedy Only Fools and Horses is about the Trotter brothers who live in Peckham, South London and the highs and lows they face trying to get rich. The sitcom was created and written by John Sullivan (The Two Ronnies, Roger Roger) and ran from 1981 – 2003, becoming one of the most loved sitcoms. 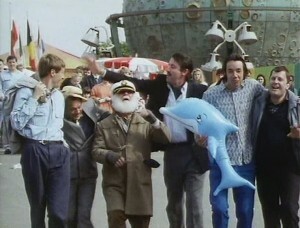 The Jolly Boys’ Outing episode was directed by Tony Dow (Babylon 5, Honey, I Shrunk the Kids: The TV Show) and stars David Jason (Open All Hours, The Darling Buds of May) as Derek ‘Del Boy’ Trotter and Nicholas Lyndhurst (Goodnight Sweetheart, Rock & Chips) as Rodney Trotter and Buster Merryfield (Shroud for a Nightingale, Strangers and Brothers) as Uncle Albert. The supporting cast also boasts many familiar face including Roger Lloyd-Pack (The Vicar of Dibley, Harry Potter and the Goblet of Fire), Tessa Peake-Jones (Marchlands, Holby City) and Paul Barber (The Full Monty, Coronation Street). Margate was the main destination in the episode where the boys visit theme park Dreamland. The former Broadstairs Police Station also features in the episode as well as the now closed Roman Galley Pub in Herne Bay which was used for the pitstop location where the gang stop off on their journey to Margate. Margate is a delightful seaside town with a sandy beach, harbour, arcades, and period housing. The area has been seen on screen before featuring in productions such as BBC One’s improvised drama True Love (2012), The Apprentice (2009) and feature film Last Orders (2002). Herne Bay boasts beaches and seafront gardens as well as many shops and eateries, amusement arcades and a windmill. Productions that have chosen to film in the area include Peter Andre’s 60 Minute Makeover (2013), Got To Dance (2012) and Things I Haven’t Told You (2008). The Jolly Boys’ Outing episode of Only Fools and Horses was first shown on Christmas Day 1989 and is now available on DVD. This entry was posted in Filmed in Kent and tagged Broadstairs, Dreamland, Herne Bay, Margate, Only Fools and Horses: The Jolly Boys' Outing film locations, tv entertainment. Bookmark the permalink.